MANILA, Philippines — Newly appointed election commissioner Moslemen Macarambon is not among those recommended by former chief justice Hilario Davide for the post, according to a report from the government watchdog Transparency and Accountability Network (TAN). TAN executive director Vince Lazatin said the information was relayed to him by former Commission on Elections chairman Christian Monsod, who is in New York now and has spoken to Davide, now Philippine Permanent Representative to the United Nations. 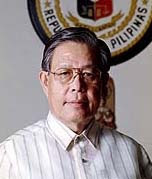 “I just talked to Ambassador to the UN and former CJ Hilario Davide Jr. here in New York and he said that he never recommended Judge Moslemen Macarambon to the Comelec,” was Monsod's text message to Lazatin, which was forwarded to INQUIRER.net. Malacañang had said that Macarambon was appointed to the Comelec on the recommendation of Davide, who was a presidential consultant on electoral reforms before he was posted to the UN. "Trans-Asia, through its legal officer, apologized for the inconvenience and informed respondents that if the offered accommodation would not be acceptable to them, petitioner would be willing to refund the ticket. Despite the offer, Judge Moslemen Macarambon became furious and expressed his intention to bring the matter to court. Brandishing his calling card to petitioner’s employee, respondent judge said: “You know I am a judge. You should have accommodated me first. "3 Rollo, p. 6. Respondents immediately disembarked from the vessel."